This is one of my favourite theatre companies ever. They are really special for all sorts of reasons. Go see this! 70 plus performers, some politics, and an inspiring Wednesday night out. Tickets are free but booking is strongly advised. For nearly two decades The New Factory of the Eccentric Actor has created some of the most exciting, immersive and unexpected theatre in London. Famed for their large-scale recreations of revolutionary events, the company employs vast casts to sweep their audiences into the maelstroms of history. In 2007 they restaged the 1926 General Strike in Conway Hall, and returned in 2010 with their magnificent epic of the life of Chekhov. Now they are back with the première of their latest work. 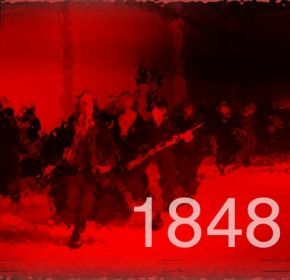 1848 is an examination of the Europe-wide revolutions of that year, the most widespread wave of revolution in history. From a February uprising in France, through Germany, Austria, Hungary and Denmark, to South America, some 50 countries were caught up in revolutionary fervour by the end of the year. Rejoin the Revolution for one night only at Conway Hall. As with all of the company’s projects this will, in a true spirit of egalitarianism, by a Free Event.